A surprising sight on a January Sunday morning near the Monument. 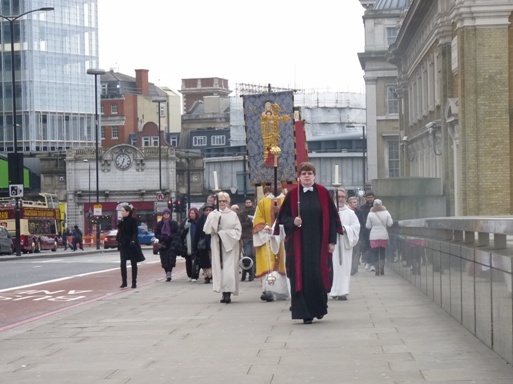 Peals of bells from the historic church of St Magnus the Martyr, Lower Thames St., then a procession of emerges: Vergers, Deacons, cross and banner carriers and Clergy, leading out an actual Bishop, in festival apparel of white and gold. 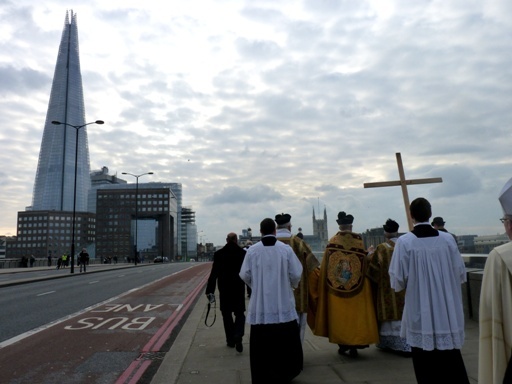 An interested audience of church goers, heritage hunters and baffled tourists, follow the procession on to London Bridge, politely jostling for photo opportunities. 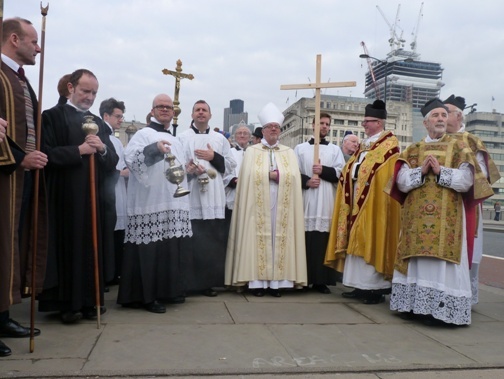 It is the fine, but not very old, tradition of Blessing the River Thames. It was the idea of Father Philip Warner of St Magnus’ about a dozen years ago. 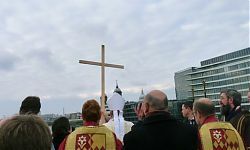 It combines the eastern Christian tradition of blessing water by dipping a cross in it, with the under – celebrated feast of the Baptism of Christ by John the Baptist, generally held on the first Sunday after Epiphany. The St Magnus party halt in the middle of the bridge and wait, with pious expressions and incense burner swinging, for several minutes. 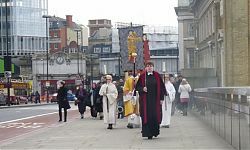 Then relief, as a matching party from Southwark Cathedral is seen approaching, and the short annual service can get underway. 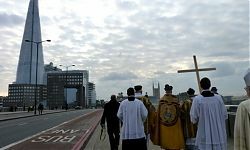 There are canonical readings, Psalm 46 and prayers for those who live and work on the Thames, including the Bridge House Trust, Port of London Authority, River Police, RNLI, and those who have died on the river, especially those lost on the Marchioness and those who ended their own lives in the Thames. 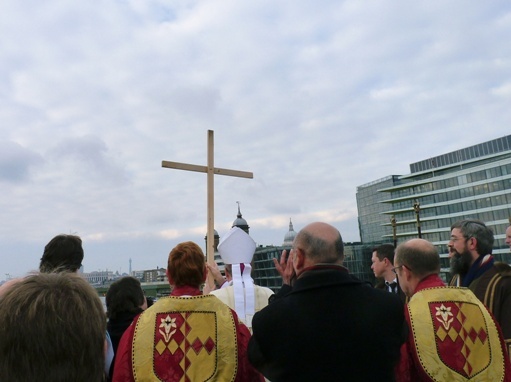 Then the Suffragan Bishop of Croydon, invoking the grace of the Holy Spirit descending on the Jordan, drops a wooden cross into the waters below, which is soon carried away towards the sea. Returning to St Magnus’ a very acceptable buffet with wine is provided, along with an opportunity to admire this fine church that stood for centuries at the end of London Bridge. 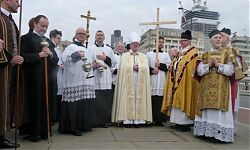 Probably originating c. 1100, it was an early casualty of the Great Fire, rebuilt by Wren, but much modified since, it now provides worship in the Anglo Catholic tradition. Apart from some historic tomb monuments, it has a fine model of Old London Bridge, while outside are some stones from the old bridge and a robust timber from the Roman river revetment excavations of Regis House 1929-31.